Asphalt Drum Mixing Plants (as per American Specs) are being manufactured both in mobile and stationary version. Usage: Construction of highway, city road and parking lot. Model/Type: Mini Asphalt Drum Mix Plant, Easy to Install and easy to relocate. 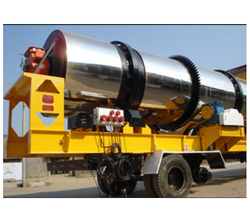 With the support of skilled team of professionals, we are engaged in providing an extensive range of Asphalt Drum.